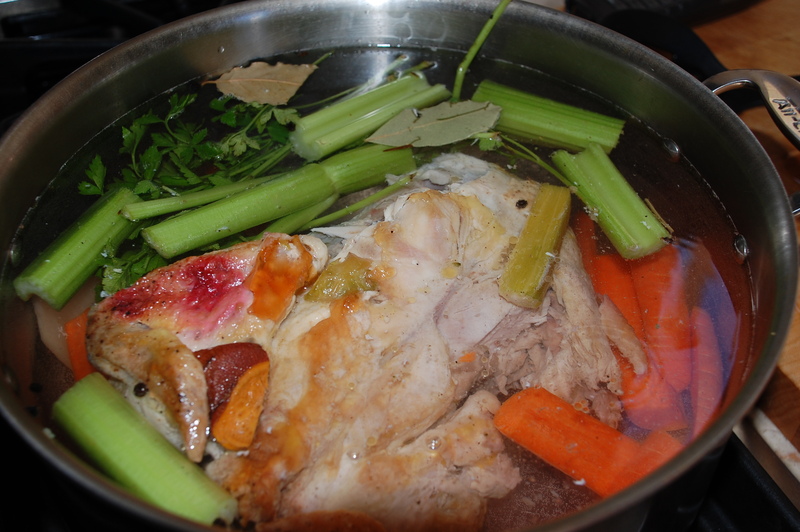 One of the rewards of roasting a simple, delicious chicken at home (see this post), besides the great leftover options, is that you can use the carcass to make a quart or two of wonderful broth that will elevate any future soup and stew you make. I can usually squirrel away some broth into the freezer but inevitably (and much to my delight, being the Jewish mom that I am) one of my girls will ask for a dinner of chicken soup as soon as they see it. Lately, we end up doing roast chicken one night, leftover chicken for lunch and possibly dinner the next day, and chicken soup another night the same week. Sounds like poultry overload as I write but it somehow works. Combine the above in a large stockpot and cover with cold water. The chicken should be completely covered by 1-2 inches of water ideally. Bring to a boil then simmer for 1-2 hours, depending on preference. The longer you simmer, the richer the broth. I prefer my broth simple, but feel free to add other herbs and spices as you desire. Refrigerate overnight or for at least 8 hours, which allows the fat to collect at the top. Strain cold broth through a fine mesh strainer into either a new pot if you are making chicken soup right away or into storage containers. Refrigerate or freeze as desired. I like to grill boneless cuts of chicken quickly on the stovetop to serve as the base for my chicken soup, though you could also poach the chicken, or stew it. 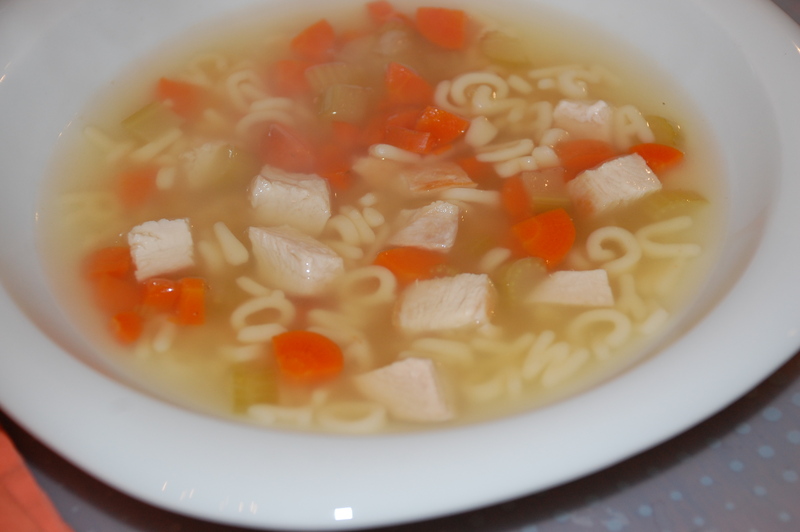 Once the chicken is cooked, add the chopped carrots and celery to the chicken broth and bring to a boil. Add your choice of rice or noodles (if using brown rice, cook it separately and add toward the end of preparation, once carrots and celery are desired softness) and simmer for about 20 minutes. Add chicken, cook for another 5 minutes, garnish with chopped parsley and serve. You can’t go wrong with this simple treat but I especially love the Mexican version with chopped avocado, onion, cilantro and rice. Serve with a good crusty bread for a simple weeknight dinner. How much rice or noodles do you add to the 2 quarts of prepared broth? I think that depends on whether you want the soup brothy or thicker. I usually throw in a handful or two of either rice or pasta. The easiest way to gauge amounts is to cook the grain separately and add it to the soup once it is done, in whatever amount is desired. Love the big letters for the soup. Where did you find them? I bought them at Rainbow but they were quite small in their dried form. Italian brand, if I remember correctly.